Sant'Angelo Village is nestled against a private beach between the Adriatic Sea and the Venetian Lagoon. The village is located in Cavallino, a few kilometres from the popular tourist destination Jesolo. Here, holiday makers have access to a wide range of luxury accommodation such as mobile homes with a vast array of amenities. You can also look forward to lots of entertainment, making sure that your whole family will have a fantastic holiday. Sant'Angelo Village holiday camping site is just a stone’s throw from the world famous city of Venice. You can take a day excursion out to see one of the most beautiful sites on earth, with its winding canals, historic museums, and stunning artwork. Why should you choose Sant'Angelo Village LUX-camp? 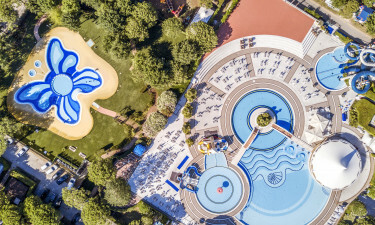 As well as the luxury camping village’s swimming pool and outdoor activities, it offers a large amount of practical amenities. Public telephones are available, just in case your mobile runs out of battery, as well as a coin-operated laundry service; perfect for families with a lot of washing to do! They have an information office with safe deposit box rental, and a day trip reservation service for people wishing to book excursions. You can even purchase Wi-Fi, to make sure you can stay connected to your friends. For visitors’ safety and peace of mind, there is a daily medical service, and first aid can be provided at the lifeguard stand. Sant'Angelo Village prides itself on the entertainment that it provides for families. There is a team of well-trained playtime activity organisers on hand to make sure your kids have the holiday of a lifetime! They can expect to take part in a wide variety of sports and games, including badminton, football, and ping-pong. Children also have access to a playground, and the fantastic water park, that will be loved by people of all ages. 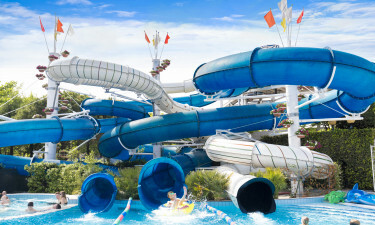 There are plenty of slides and water shoots, as well as a heated pool for little children. As for the adults; why not take a stroll in the beautiful ‘Garden of Roses’ a haven away from the hustle and bustle of the park. 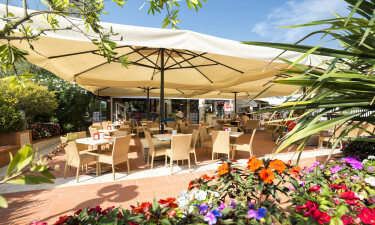 At Sant'Angelo Village luxury camping site there is a restaurant and pizzeria that serves up delicious local delicacies such as pizza, pasta, fresh fish and salads. There are also three ice cream parlours in the village; one near the beach, one near the pool, and one by the main square. At Sant'Angelo Village holiday camping site there is a mini supermarket that is well stocked with all your daily essentials such as milk, bread, cheese, and fresh fruits and vegetables. There is also an international news stand, and a bazaar that stocks holiday toys and supplies.